In part 1 of this two-part series, I discussed the whole life cost implications that organizations face when managing its assets and asset fleets. In this post, I’ll cover when it’s time to stop trying to restore an asset and swap it out for a new one. The point when it becomes more cost-effective to replace an asset or fleet of assets is known as the cross-over. This is typically a time when the projected operating costs exceed the alternative depreciated capital costs. This point can be viewed in a chart or table that expresses the “cash flow” associated with specific periods within the asset lifecycleMost of us are probably familiar with spreadsheets and how easily it can be manipulated. Spreadsheets are often used to determine the estimated lifecycle costs of an asset or fleet of assets—but the truth is, these spreadsheets are not always up for the job. The main issue here is that spreadsheets aren’t scalable. Users are forced to find all of the data needed to base costal projections, and to manually escalate the historic costs based on when it occurred and when it will be applied. A more holistic approach would be to perform lifecycle cost analysis in an enterprise application or platform that’s already cognizant of the operating costs and maintenance histories. At some level, this means integration between the lifecycle cost calculator and a computerized maintenance management system (CMMS) or enterprise asset management (EAM) system. Having access to the maintenance history and the costs associated with it begins to unleash the capabilities of the lifecycle cost calculator, but only tells a portion of the story. As failures occur, the cost of repairing the failure must be added into the costs associated with production loss. This type of 360 degree view of the data is what’s needed to really understand, and project, the costs associated with operating and maintaining assets or fleets of assets. No analysis can be considered complete until the user has had an opportunity to consider the alternatives. What happens if a certain maintenance activity is performed more often or less often? Will it improve performance, and if so, how much? Let’s consider a relatively common asset, a distribution transformer, which has a current value of $1 million and is 30 years into its 35 year projected lifespan. The asset owner or operator, in this instance, has the option to refurbish the transformer for $1 million— which would provide an additional 10 years of life—or to replace the transformer for a cost of $3.5 million—which would provide an additional 35 years of life. On top of that, asset owners would also have the option to blend these approaches by refurbishing the transformer and replacing it in 10 years at an estimated cost of $4.5 million. When considering these three options, the best answer becomes clearer when the lifecycle costs have been presented in a logical and actionable manner. To do this, all of the three scenarios must be analyzed in a side-by-side fashion to determine in when it makes the most sense to take on the capital costs associated with refurbishment or replacement of the asset. This screenshot shows whether it's better to replace an asset with a 15-year lifespan proactively at 5-year intervals, once at 10 years or to run the asset until the end of its lifespan. This screenshot showcases the value of each scenario, indicating replacing the asset at 5-year intervals is the best financial decision. As I mentioned in my first post, there isn’t a crystal ball that asset owners can look into to determine exact future costs. Any estimate or projected cost will have variability to some degree. It’s also important to always review previous lifecycle cost data to help see if projections and estimations were accurate, and if not, how far off the estimates were. Good luck with finding this data easily in a spreadsheet! 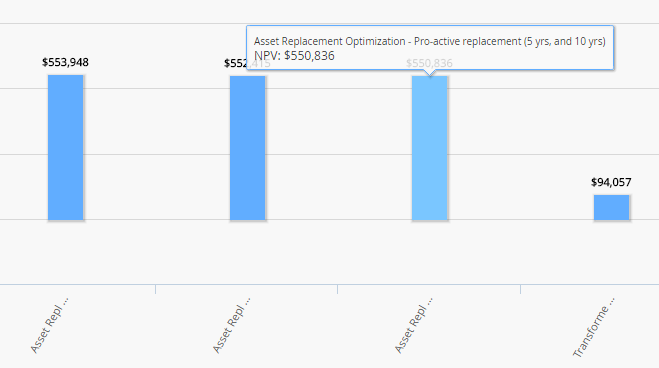 By having a lifecycle cost analysis tool, asset owners can not only determine the lifecycle cost for their assets, they can also see context. It’s this context—operating and maintenance costs—which can show a broader, more complete, picture of the assets impact on your organization’s bottom line. If you haven't already, check out our white paper, “Unlocking Business Value with Industrial Data Management,” to learn more about how to better maintain your assets with big data. With more than 20 years of experience in the Instrumentation, Controls and Reliability fields, Don brings a fresh and client-based viewpoint to the Product Management role. His experience has helped further integrate the Compliance &amp; Integrity Management solution into the overall APM solution. Don attended West Valley College in Saratoga, California and is a U.S. Navy Veteran.